Sterilization and depyrogenation are useful process in sterile pharmaceutical manufacturing and both are almost similar but have huge difference. To understand the difference between sterilization and depyrogenation, we have to discuss both of them separately, in length to really know the line that separates them. Basically, sterilization is a method that can remove, kill and deactivate microorganisms on a surface like for example the stainless equipment, media etc. On the other hand, due to the high variability of their molecular weight, pyrogens are hard to sterilize. Depyrogenation refers to removing pyrogen from a solution or pharmaceutical vials. Endotoxins are bacterial byproducts that become pyrogenic (active) when released into the bloodstream. As you are perfectly aware, eating food or injecting drugs that contain microbes will cause infections. Sterilization is used in the food manufacturing and pharmaceutical industries to destroy microorganisms that contaminate the injectables. Depyrogenation is widely used in the pharmaceutical field and that is basically to clean articles that come into direct contact with people or animals. Sterilization is possible in three known ways; heat, chemical methods, and filtration methods. Chemical sterilization is about letting toxic gases to penetrate into the material. It’s the most unstable method to use. These gasses are very poisonous (ethylene oxide) and highly explosive (and thus carbon dioxide is always added to minimize the chances of a detonation). But because pyrogens are tough even for toxic gases, a process of depyrogenation called oxidation is used in treating pyrogens in a solution of hydrogen peroxide. Filtration is literally about filtering the bacteria in a solution using specific bacterial filters. This is good for sterilizing heat sensitive liquids though the main disadvantages are: a) High chance of clogging and b) extended time to complete the process. There are three types of filters: Membrane filter which is made from cellulose can be put in a syringe for online sterilization of gasses or liquids. Seitz filters are thicker than membrane filters. They are padded to prevent rupturing but the disadvantage for that is that solution can get absorbed in between. Since the size endotoxins can vary widely, ultrafilters can be used and this method is called depyrogenation. However, filters are limited to the size of endotoxins they can remove. Smaller endotoxins can manage to cross through the filter. Dry heat sterilization and depyrogenation are the cheapest and most common of all. And this is where sterilization and depyrogenation sound very similar. However the later deals with pyrogens while the first one only deals with any thermal sensitive microbes and spores. The duration of the heat and the temperature are base conditions for dictating the extent of sterilization in both processes. Sterilization using heat is possible in the form of dry heat (hot air oven, incineration, flaming, radiation sterilization) and moist heat (boiling, pasteurization and steam). Depyrogenation of glass vial is very popular for sterilizing pharmaceutical vials. 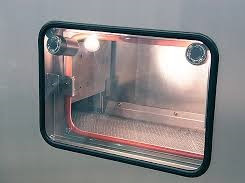 It involves heating articles in depyrogenation tunnel which have been specifically designed for the process for thermal stable articles where the normal sterilization process has failed to eliminate them. Depyrogenation and dry heat sterilization are basically different processes for achieving the same result that is to kill endotoxins and exotoxins. What will be the condition of depyrogenation in autoclave..temp tempera and time ?